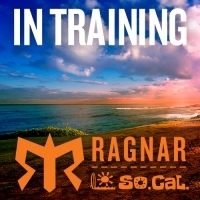 The Green Girl is preparing for her third Ragnar Southern California relay with her team 'All About That Pace!'. I recommend packing the majority of your stuff in a backpack or duffel bag that can be stored in the trunk of the van but also bringing a smaller bag that you can have with you in the van for ready access to essentials. Pack 3 complete changes of outfit in individual gallon zip bags so dirty clothing can be sealed in the bags. Also store all your safety items (see 'Safety' list below) in a single zip bag so you can easily grab it for the Safety Briefing inspection. A towel is indispensable - you can roll it up as a pillow, you can use it as a blanket if you get cold, you can sit on it when you are sweaty, you can use it as a barrier when you're changing - and the list goes on. I cannot say enough good things about Target up & up Sensitive Skin Wipes - trust me on this one, go pick up a pack or two. Another tip is to stick the spare van key in a magnetic keycase to avoid accidentally locking your team out of the van. The Green Girl was contacted by Trusted Health Products to review their The Runner's Choice foot recovery product. The Runner's Choice is comprised of a proprietary blend of almond, eucalyptus, eucalytol, wintergreen, peppermint, and spearmint oils. Almond Oil is antioxidant rich, high in vitamin E, and contains many essential nutrients. Eucalyptus has antibacterial/antiseptic, anti-inflammatory, and analgesic properties. It also creates a cooling and refreshing effect. Wintergreen contains salicylic acid and methyl salicylate and therefore acts as a natural pain reliever. It also increases blood circulation. Peppermint has analgesic, anti-inflammatory, and anti-spasmodic properties. It also provides a cooling sensation and has a calming effect on the body. Spearmint has antiseptic, antispasmodic, restorative, and stimulant properties. It also contains vitamins, antioxidants and vital nutrients. 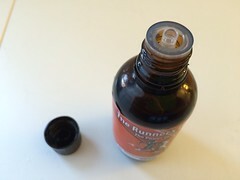 The Runner's Choice comes in a 2 ounce amber glass bottle with an orifice reducer for dispensing a drop at a time. Apply to feet immediately before and after running, jogging, or when you will be on your feet for long periods of time. Coat the bottom of your feet, between the toes and the top and 2 inches above the ankle for best results. Do not rub in (rubbing is not required for effectiveness). Wash hands after use. The Runner's Choice has a soothing but not overpowering minty fragrance that I found refreshing. I was initially hesitant to rub essential oils on my feet and ankles because I didn't want to end up all oily but I was pleasantly surprised to see how quickly The Runner's Choice was absorbed into my skin. I was pleasantly surprised to see how quickly The Runner's Choice was absorbed into my skin. I used The Runner's Choice on my sore feet post-LA Marathon and I felt like it aided my recovery. When I woke up the next morning, my feet were no longer sore and I was able to workout the day after the race. The skin on my feet has also become softer and smoother since I started using The Runner's Choice. Trusted Health Products would like to give 3 of the The Running Green Girl's readers a chance to win their very own bottle of The Runner's Choice. To enter the giveaway, simply log into the Rafflecopter widget below. Please note this giveaway is only open to residents of the U.S., Canada, Europe, and Australia. Log in via Facebook - choose this option and a pop-up will ask for permission to access Facebook details. Rafflecopter needs to access email addresses via Facebook in order to contact winners. Use your email - leave a name and email address. Your email address is PRIVATE and I will not share or publish it anywhere. Giveaway ends Friday, April 3rd at 12:00 midnight Pacific Time. If you encounter any issues entering this giveaway via Rafflecopter, please let me know. for taking the time to enter this giveaway!